At least 20 killed, 100 wounded in shooting attack on country music festival in Las Vegas. Gunman shot and killed inside resort. At least 20 people were killed and more than 100 more wounded in a mass-shooting attack at a country music concert in Las Vegas late Sunday night. 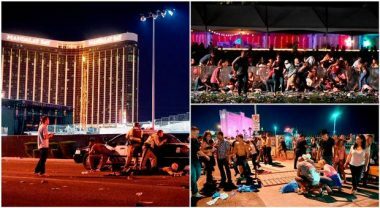 A gunman opened fire with a fully automatic weapon at concert-goers at a country music festival at the Mandalay Bay resort just before 10:30 p.m. local time. The shooting apparently targeted the Route 91 Harvest festival, and began during the performance of country music singer Jason Aldean. Local police have called for those in the vicinity of the shooting to evacuate. “We’re investigating reports of an active shooter near/around Mandalay Bay Casino. Asking everyone to please avoid the area,” Las Vegas Metropolitan Police tweeted. Authorities say 20 fatalities have been confirmed, and that some 100 people were wounded. Fourteen of the wounded are in critical condition. University Medical Center spokeswoman Danita Cohen reported that the hospital had taken in “several” victims with gunshot wounds. Local police later declared the shooting a “mass casualty incident”, and say that the scene is still “active” at this time. One witness told KSNV-TV he believed there were multiple shooters, saying that hundreds of rounds had been fired at the audience. Others told Fox News that they had seen a concertgoer shot in the head. Police have shut down part of the Las Vegas Strip and are searching for the gunman. McCarran International Airport has temporarily suspended all landings and takeoffs, airport officials reported. There are also unconfirmed reports of multiple shooters, including claims that one gunman opened fire from the 32nd floor of the Mandalay Bay resort hotel. Police say that one suspect was shot and killed on the 32nd floor of the Mandalay Bay resort, adding that no additional shooters are believed to be at large.